I have a several vendors that I visit almost every Saturday Morning at our local Farmer's Market. I LOVE shopping there. Not only is everything fresh, inexpensive, local and organic - it's so beautiful, and just a lot of FUN! I enjoy seeing the same vendors every week, checking out the produce selections and what's currently being harvested - exchanging cooking ideas and talking foodie with them too. 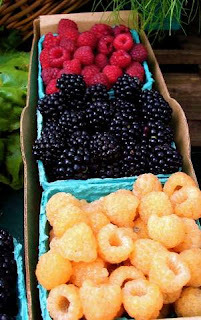 One of my favorites, Terry's Berries, is a local Family Farm & C.S.A. producing amazing fruits and veggies year round here in our green little valley... I can never scrape up the bucks for a CSA membership (I wish!) but I make sure to stop by their market stall or the farm whenever I can; they have the beautiful strawberries, greens, broccoli and herbs right now and usually they'll have an interesting or new veggie or green waiting for me, that I can't resist trying. So, besides the usual produce, today I splurged on a pound of fresh-made (and vegan!) 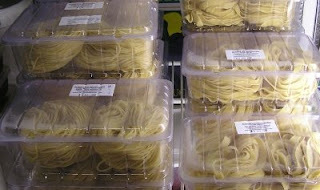 pasta from Pacific Pasta as well. They have all sorts of beautiful stuff, unfortunately only a couple varieties are egg-free. I'm hoping they'll add more to their line-up. Later in the evening we thought pasta sounded good, but I wasn't feeling all that inspired though, so decided to just do something simple and familier. I cooked the pasta al dente because I'm all Martha-Stewart like that, (which means I boiled it about a minute!) chopped and steamed some perfect broccoli from Terry's Berries, threw in leftover sauteed portabellos, (I know, who can have leftover mushrooms, right?) 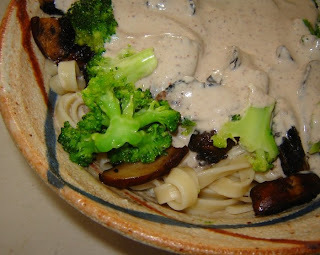 and whipped up my famous (well, famous in my mind anyway) Cashew Alfredo. On a last moment whim, I threw about six pitted kalamata olives into the processor while blending the sauce. WOW! I wasn't expecting much, but I think I'm really on to something here. Oh my gosh, the kalamata olives gave the sauce this INCREDIBLE rich flavor (and a weird speckled purple color) that I will definitely be repeating again soon. Just use the purple-y kalamata or Greek olives. I think the effect would be lost with plain, can-variety black olives. Best of all? This was big-time kid-approved too, they seriously LICKED the pan clean, brocolli and all! Even if you're not an olive fan, try this, the rest of your family will thank you! AHHHH, those berries look splendid - yum! Berries and fresh pasta and perfect broccoli? I'm having farmers market envy. Your pasta dish sounds delicious!